Since their discovery in the late 1960s Gamma Ray Bursts are among the most puzzling phenomena of the sky. In the last 40 years much has been discovered about these sources, nevertheless much remains still unknown about their nature and physics. The detection of 50 GeV to few TeV emission from a GRB will provide an unprecedented opportunity to enlighten the nature of the central engine and the interaction between the relativistic flow and the environment of the burst progenitor. Thanks to its fast repointing capability MAGIC is able to detect high energy (HE) emission from the GRB during the prompt emission, the X-ray flaring and later during the afterglow phase. Most of the theoretical models predict that VHE gamma rays will accompany the keV-MeV radiation of the prompt emission phase of a GRB. It is therefore mandatory to observe satellites trigger as soon as possible in order to reduce delays during the first seconds of a GRB and MAGIC is at present the only IACT being able to reposition within few tens of seconds. Moreover, long VHE emission, reaching tens of GeV, from GRBs has been already observed up to thousands of seconds after the burst onset by Fermi-LAT. 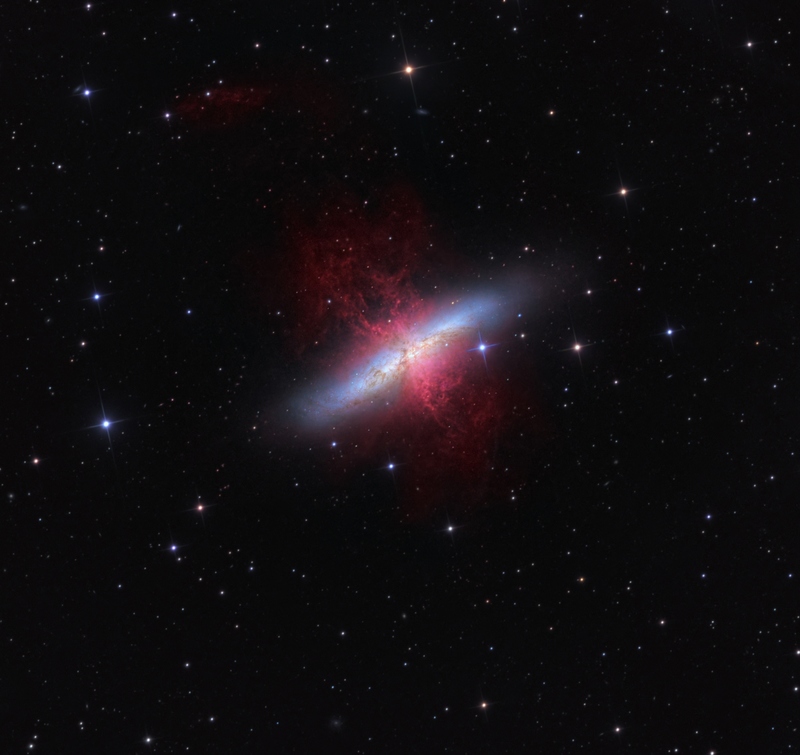 In addition X-ray flares are observed in about 40% of the GRBs during the first hundreds of seconds of the afterglow. These flares should be also observable at the 100 GeV regime by the more sensitive ground based detectors, provided that the burst is nearby z < 1. The variety of theoretical scenarios on the prompt emission makes very important any possible detection or stringent upper limits. GRB prompt observations are therefore considered one of the highest priorities for the MAGIC project. While only 2 AGN (Mkn 421 and Mkn 501) were known in 1998 and 7 in 2003, in the last 10 years the number increased impressively, thanks to the new generation of IACTs. The distance of the sources also increased considerably: while the first confirmed TeV AGNs were rather local (z < 0.05), some of the sources recently discovered lies at redshift larger then 0.2 (and several distant sources have uncertain and even unknown redshift). The present record belongs to the quasars PKS1441+25 and QSO B0218+357, located at z = 0.9, both observed by MAGIC. QSO B0218+357 is also the first gravitationally lensed blazar ever detected in the Very High Energy range. The large majority of these objects are blazars, radio-loud AGNs characterized by relativistic jets pointing close to the line of sight. The overall spectral energy distribution of blazars, extending from the radio band to TeV energies, shows two broad components that, for all TeV sources but 3C279, peaks in the optical-UV-X-rays band and in the GeV-TeV band. The level and the position of the two bumps is variable in time, also on very short timescales. Most of the TeV emitting blazars belongs to the subclass of the high energy peaked BL Lac objects (HBL), blazars in which the low energy component of the Spectral Energy Distribution (SED) peaks in the UV-X-ray band. Only few low energy peaked BL Lac objects (LBL, peaking in the optical-IR band) have been detected. HBL are the most powerful sources in the TeV band, since the high-energy component peaks just in this spectral region. LBL (and quasars), instead, present less powerful TeV tails. This fact, together with the average larger distance (determining also an increasing role of the absorption through the interaction with the extragalactic background light, see below) translates into a lower TeV fluxes for these sources. Therefore, the present knowledge of the extragalactic TeV is certainly biased. The discovery of the quasar 3C279 by MAGIC demonstrates that also non-BL Lac blazars can be TeV emitters. Credits: courtesy of European Southern Observatory. The diffuse photon background may be classified according to its origin: The Extragalactic Background Radiation (EBR) and the Diffuse Galactic Emission (DGE). EBR is essentially isotropic, and is well established up to energies of some 50 GeV. In the energy range from 30 GeV to 100 TeV, a large part of the EBR may be due to the direct emission from Active Galactic Nuclei, which have not yet been resolved. Besides their astrophysical relevance, blazars can be used as beacons to characterize the EBL through its interaction with gamma-ray photons. Gamma-rays emitted by extragalactic sources, during their travel from the source to the Earth can interact with the EBL photons through the pair production process γ + γ → e+ + e−. Due to the characteristics of the pair production cross section it is possible to assume that photons with a specific energy E are basically selectively absorbed through the interaction with a soft photons of frequency n = 2x1015(E/100GeV)−1 Hz. Ideally, comparing the observed spectrum of a blazars with the intrinsic one, one should be able to derive the intervening absorption and, in turn, characterize the spectrum and the level of the EBL. 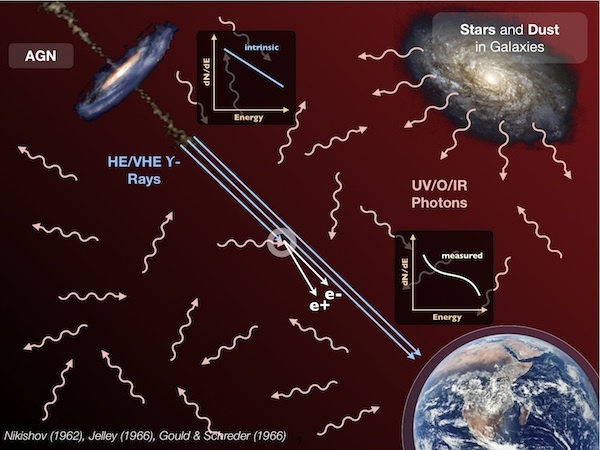 Using blazars located at different redshift one could even derive the evolution of the EBL with cosmic time. High star-formation and supernova (SN) rates in starburst galaxies (SBGs) enhance the energy density of energetic nonthermal particles—mostly electrons and protons—which are Fermi-accelerated in the sites of SN remnants. Coulomb, synchrotron and Compton energy losses by the electrons, and the decay of pions following their production in energetic proton interactions with the ambient gas, result in emission over the full electromagnetic spectrum, from radio to high-energy gamma-ray. The higher level of emission in SBGs—compared to that in ‘normal’ galaxies—motivates consideration of the detection of nearby SBGs by current and future IACTs. When VHE gamma-ray emission is detected, important additional insight will be gained on the origin and propagation mode of energetic electrons and protons in SBGs.